Moridi (Tehran, Iran) on 4 April 2009 in People & Portrait and Portfolio. @nazanin: Thanks for your visit and comment. What a beautiful shot. I love the tone of traditions that you've given here. Excellent. @Ajay: Thanks for your visit and comment. Wow! 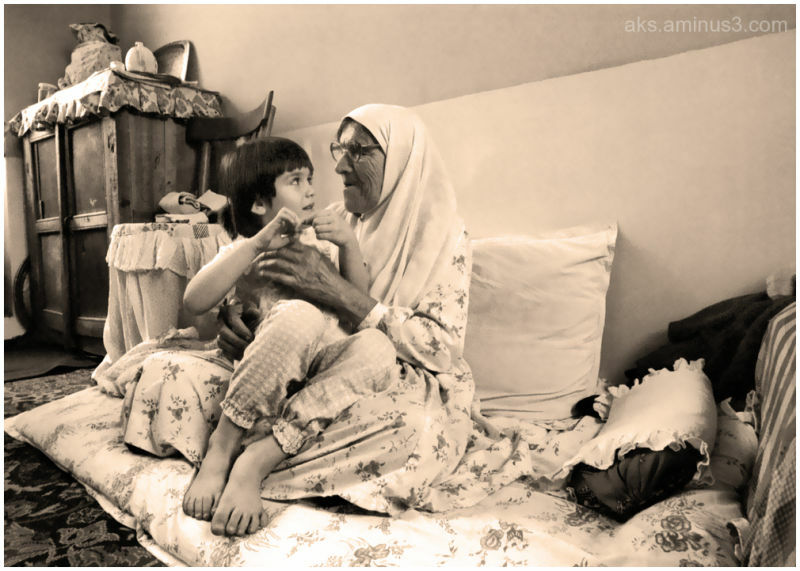 this is such a beautiful moment captured between child and granny! wonderful! @Pavan Kaul: Thanks for your visit and comment. This whole series is really fantastic. A warm affectionate and compassionate approach to older people and lives they lead. It really shows us the grandparents are a gift from God. @Mobius Faith: Thanks for your visit and comment. Thanks again. I love in particular the way the cabinet in the far corner seems to be not-square which alters the perspecive of the whoe rest of the image. One of those wonderful accidents perhaps. @joemulligan: Thanks for your visit and comment. Wonderful image and I love the processing! @Scott Schilling: Thanks for your visit and comment. @Titan: Thanks for your visit and comment. @hajar: Thanks for your visit and comment. Very interesting little series. Nice. @Darin: Thanks for your visit and comment. @ALI ZAIDI: Thanks for your visit and comment. @eva: Thanks for your visit and comment. What a blessing when the grandparents are still living when the grandchildren are born and growing up! @Val: Thanks for your visit and comment. @Tamas: Thanks for your visit and comment. Very sweet image! it moves me! @Ricardo: Thanks for your visit and comment.